Creativity Abounds at DIY Club Inc.! DIY Club Inc. is a fun new website where you can show off your DIY crafting skills! Hosted by six wonderfully talented bloggers and some pretty great sponsors (if we do say so ourselves! 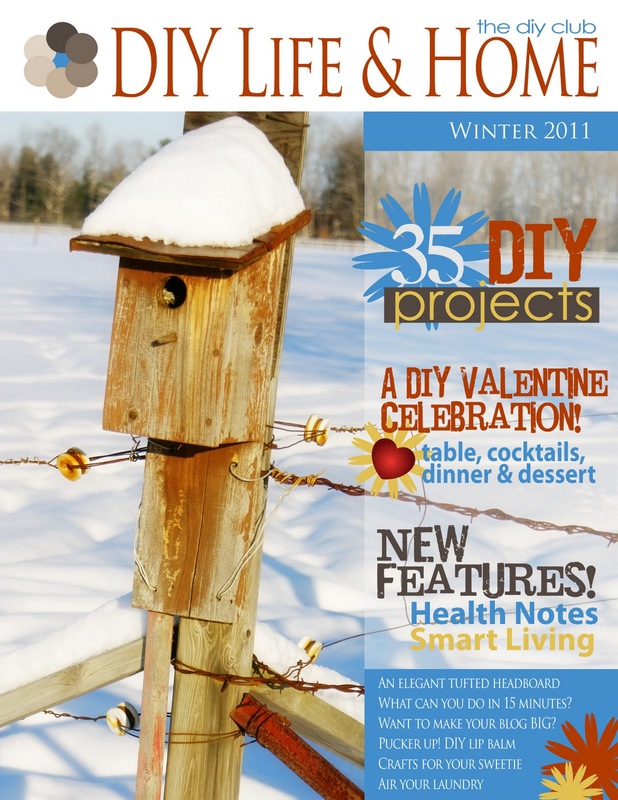 ), the DIY Club hosts a monthly “linky” party where you can link up to your own blog post showing off a project you have done. The project can be pretty much anything, but must use products from at least one of the DIY Club’s sponsors. Although it’s only been around since May, the website itself has just gone through a major re-vamp, and the grand unveiling was this week. It’s looking better than ever! It even includes a page where you can see all the projects done with Rockler products – how cool is that?! You’ll find you want to follow every single one of these gals. Put the six of them together and the DIY Club just bursts with inspiration! Every month, the gals offer up their own projects for your enjoyment and inspiration, and then they accept your entries for the month. Most of the posts you’ll see are done in a tutorial style, so you really do come away just bubbling over with ideas for things you could do in your own home. •Amy of WhisperWood Cottage shows us that Autumn Comes in Coastal Blue Milk Paint! Wooden chairs found while junking are freshened up by using milk paint, a finishing turntable, a Sanding Bug and foam brushes, all from Rockler! The DIY Club link-up parties start on the first Friday of every month… which would be… today! If you’ve got a blog and you’d like to enter a project (oh, maybe something made with Rockler tools and supplies, for instance?) then by all means, link up here and put yourself in the running for some truly awesome prizes! The six hosts and one guest blogger will pick the top ten entrants, and then critique those entries before choosing an overall winner. Rockler is proud to sponsor DIY Club Inc – a fun new website made up of six incredibly creative bloggers/DIYers who are always thinking outside the box and who really enjoy inspiring others to do the same! Every month, the gals offer up their own projects for your enjoyment and inspiration before hosting a linky party for you to show off your own projects (and win some fabulous prizes!) Most of the posts you’ll see are done in a tutorial style, so you really do come away just bubbling over with ideas for things you could do in your own home. The six bloggers that make up THE DIY CLUB have been inspirational to their readers from the start. After seeing their first series of projects, DecoArt knew that our partnership and sponsorship of this year-long blogging adventure was going to be a win-win for everyone involved. Most importantly, readers of each of the six blogs have been inspired themselves to either use one of the sponsor’s products, or all of them, on their submitted projects for each month’s contests. We’ve seen so many great user-projects come through using craft paint. Sometimes it might not be our paint alone, but DecoArt is just excited to get consumers using craft paint again for their craft and home décor projects! We know that eventually the followers of the six blogs will come to see DecoArt as a producer of high-quality artists and crafter’s paints. Working with the ladies of THE DIY CLUB, Inc. has been more than a pleasure. We are always so surprised and inspired by the quality of projects they create to inspire their readers each month. They all have found so many innovative ways to use each of the products we provide them with…with little to no direction from us! While it might seem like it’s easy to create so many wonderful projects to their readers, we know that THAT is only because these six fearless bloggers make it LOOK so easy! Always being on-target with creative and crafty designs and projects is no easy task…and we’re so impressed by what we’ve seen from THE DIY CLUB, Inc. ladies. THE DIY CLUB, Inc. experience kicked our blogger-outreach efforts into hi-gear! We had traditionally developed one individual relationship with craft bloggers in the past… THE DIY CLUB, Inc. gives sponsors the opportunity to work with SIX bloggers at once, and even a guest-blogger once a month! That’s seven quality blogger relationships, all from working with one well-organized network of passionately crafty ladies! DecoArt would highly recommend any additional sponsor to jump at the chance to work with THE DIY CLUB, Inc. It’s not all that often that an opportunity comes along in which one-fell-swoop allows you to reach so many readers and viewers, see real-time responses for users who have never heard of some of your products but now can’t wait to try them, and, best of all, your company or products are being promoted by extremely trust-worthy and easy to work with bloggers. The Gorilla Glue Company hosts a DIYClubInc.com Link Party. Join the link party fun at http://diyclubinc.com/2010/09/the-gorilla-glue-party-event. CINCINNATI (September 9, 2010) – The Gorilla Glue Company is hosting a creation event in conjunction with DIY Club. The theme of this first ever event is Something Old, Something, New, Grab the Crew, & the Gorilla Glue. The link party continues through the end of September. Winners of the link party will be selected by the DIY Club bloggers at the end of the month and announced on the DIY club blog shortly after the event. The prizes for the event include both Gorilla Glue products and promotional items, sponsored by Gorilla Glue. * Gorilla Glue®: The adhesive that started it all. Gorilla Glue is known for the outstanding bonding power and ability to stick to almost any surface. Gorilla Glue is 100 percent waterproof and dries completely non-toxic. The original Gorilla Glue formula is available in 2oz., 4oz., 8oz., 16oz., and 36oz. sizes. * Gorilla Glue® Dries White, 2X Faster: The same bonding properties as Gorilla Glue but in a formula that dries white. With a clamp time of only 30 minutes, this formula will also allow you to move on to the next project twice as quickly. Gorilla Glue Dries White, 2X Faster is available in a handy precision pen format and standard 2oz. bottle. * Gorilla Tape®: Gorilla Tape has double the amount of adhesive as other duct tapes. The adhesive easily sticks to rough and uneven surfaces like brick and stucco, which others cannot. The all-weather shell also provides Gorilla Tape with the UV and water-resistance necessary to stand up to the outdoor elements. Gorilla Tape is available in 12yd., 35yd., Handy 1″ roll, and NEW Tough and Wide roll! * Gorilla® Super Glue: This instant glue will change your previous opinions about super glues. With tiny rubber particles, Gorilla Super Glue offers unmatched impact resistance. This impact resistance allows the project to stand up to the bumps and bangs of everyday life. Use on rubber, paper, wood, metal, ceramics, most plastics, and all of your quick fixes. Gorilla Super Glue is easy to use and dries in 30 to 60 seconds. Also there is a hidden metal pin inside the cap to keep it clog free and fresh for the next fix. * Gorilla® Wood Glue: As a Type II P.V. A. wood glue, Gorilla Wood Glue offers a stronger traditional wood glue option. Gorilla Wood Glue offers versatility for use on hardwoods, softwoods and natural wood composites. Non-toxic, water-based, and solvent free, Gorilla Wood Glue is safe for the entire family. It also easily cleans up with water. * Gorilla® Epoxy: Gorilla Epoxy, five minute set, is a strong and durable adhesive solution, complete with gap-filling capabilities. It is water and solvent resistant and withstands high temperature extremes. Gorilla Epoxy works well on a variety of surfaces including: metal, wood, stone, plastic, and more. With an easy-to-use syringe mixing the two part formula is a breeze. Mix it up with Gorilla Epoxy! Gorilla products offer the peace of mind of a secure fix, tough solution, and powerful adhesive bond. Gorilla products are available at retailers nationwide. Headquartered in Cincinnati, Ohio, The Gorilla Glue Company is a leading manufacturer of adhesive solutions for DIYers, woodworkers and professionals. The company revamped the retail adhesive landscape with its 1999 introduction of the wildly popular Gorilla Glue, a unique, all-purpose adhesive with an amazing ability to bond almost any material including wood, ceramic, stone, metal and more. On a mission to make products that deliver impressive results, the company has since expanded its offerings to include Gorilla Tape®, Gorilla® Super Glue Impact-Tough® Formula, Gorilla® Wood Glue, and Gorilla® Epoxy, further solidifying the brand’s reputation as the “go-to” product line FOR THE TOUGHEST JOBS ON PLANET EARTH®. Gorilla products have earned recognition for performance and innovation from multiple media outlets including Popular Science magazine’s Best of What’s New Award and Popular Mechanics Editor’s Choice Awards. The products also bear the Good Housekeeping Seal. Gorilla brand products are proudly made in the USA.